…a title its tourism department seems willing to promote and use to entice visitors looking for an escape or perhaps a discrete rendezvous. A couples weekend may be just the thing to invigorate a relationship. But let’s see if what happens in Vegas ACTUALLY stays in Vegas. The latest mega resort along the strip and the centre point of the largest privately funded development in the world. 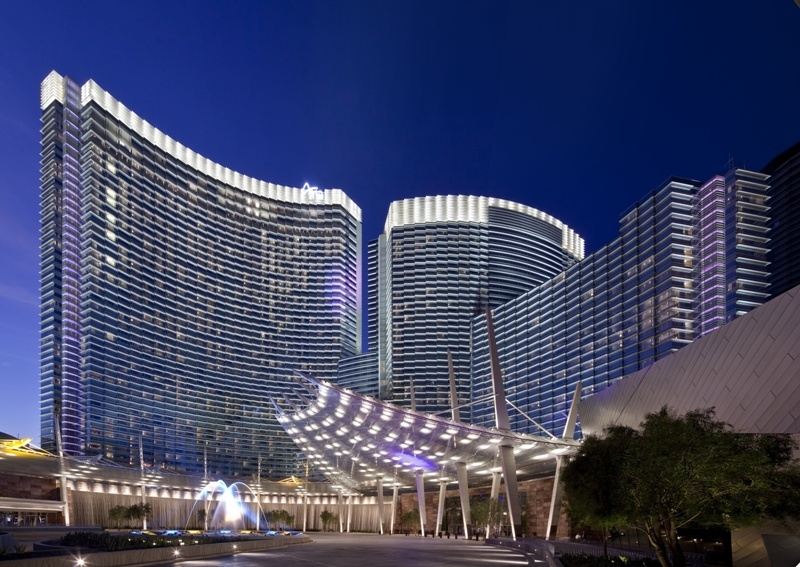 The Aria is an architectural masterpiece. The gaming, entertainment and dining spaces are unlike any other casino hotel in Las Vegas. Each of the over 4000 rooms comes loaded with more technology than your average Best Buy. For a special treat, try to upgrade to one of the corner rooms when booking online, or at the front desk when checking in. The free standing soaking tub surrounded by windows is inspirational. Really, Vegas has become a dining destination. Just about every celebrity chef has an outpost or 2 in this town. We have been known to plan our schedule around what meal reservations we can obtain. Breakfast on the patio at the Terrace Point Cafe inside the Wynn Casino. Sure the food never disappoints, however, come for the atmosphere. Sitting poolside at the Wynn is unlike your typical Vegas pool scene. Looking out over Olive and Lilac trees instils a fortress of solitude type isolation in what can be a hectic city. Sage at the Aria gives a unique spin on modern American cuisine. The interior sets the perfect mood for a romantic meal. The menu by head chef Iain McLean includes such interesting items such as: Crème Brule made with Foie Gras instead of custard and topped with flambéed bing cherries. I cannot begin to describe the interplay of flavours. Also on the menu is an Absinthe tasting, including mostly French labels with some American choices. Absinthe, otherwise known as the “green fairy” was illegal until only recently. The drink considered a digestive, proved inspirational for most of the Impressionist artists of the 19th century. However, don’t worry, chances are you won’t be drinking the quart a day required to drive you mad. Bouchon at the Venetian is the brainchild of Thomas Kelleher. Best known for the French Laundry in Napa Valley. This is the ultimate French Bistro in Las Vegas. This is no heart healthy or calorie conscious dining by any means. The romance of Paris can be found in every aspect of the restaurant from the decor to the in house bakery and majestic wine list. Don’t miss one of the Vegas outposts of In-N-Out Burger, formerly a California tradition. If you need to get some real food after to get rid of the taste of airport dreck or whenever you need to replenish after a Vegas all-nighter. Converts swear by the fresh never frozen beef and non-greasy fries. Be naughty, every adult weekend deserves a little lingerie. Agent Provocateur in the Forum Shoppes at Caesars Palace is like stepping back in time. The buying experience is almost like a private fitting and the sales staff know their stuff. This merchandise is not cheap. Not salacious enough for your tastes? Perhaps a trip down to the Las Vegas Fashion Show Mall is in order. Fredericks of Hollywood has a better handle on the raunchy selection of undergarments. Once relegated to adult magazine sales, Fredricks helped establish the lingerie industry and bring it mainstream. If you have never been to a hotel spa in Las Vegas, you have no idea what you are missing. The Spa at the Aria Hotel occupies 80,000 square feet on 2 floors in the building adjacent to the pool complex. Aside from the typical Men’s and Ladies’ areas – which are not conducive to a couples weekend – the Aria spa features a co-ed balcony and jetted infinity pool overlooking the Fluid pool club. Other co-ed areas of the spa include a salt lined meditation room as well as a relaxing room fitted with heated stone beds. Cap the afternoon off with a couples massage and you’ll both be ready and relaxed for whatever the night will bring. Entry for the day is only $30 per person. Vegas is well known for its celebrity driven club scene. Nearly everyone will tell you – once you leave your twenties – a more mature club scene exists at the VooDoo Lounge at the Rio Hotel. Located on the roof of the casino hotel, the outdoor section of the bar/lounge offers breathtaking views of the Vegas skyline. Just be warned sitting down at any club in Vegas usually means buying a bottle for upwards of $300. What is Vegas without taking in a show? Besides headline celebrity shows Vegas has almost become synonymous with Cirque Du Soliel. The latest of its 6 shows running in Sin City is Viva Elvis. The purpose built Elvis Theatre at Aria is a throwback to the days of old Vegas. The vintage couch style seating closest to the stage allows you to snuggle up during the show. Viva Elvis is a combination of concert, autobiography and human acrobatic circus performance. The number of performers, singers, set changes and even the scale of the sets is overwhelming. Old concert video and photos are projected onstage. Elvis lives on in this high energy show. You will not be disappointed. Also worth a look is the impressive row of Art and Sculpture galleries lining the walkway up to the Aria from Las Vegas Boulevard. The galleries also host impromptu wine and cheese parties from time to time. Also free maps are available at the concierge desk, which outline the locations of the $40 million Fine Art Collection hung on the walls of the Aria Resort and Casino.